Discover a corner of the world, where daily life seems to move a little slower, on an escorted tour that includes three unforgettable rail journeys through the timeless landscape of the Isle of Man. Head south from the island capital, Douglas, to the unspoilt beaches of Port Erin; north to Ramsey then west to pretty Peel; and east to Laxey beneath the green slopes of Snaefell. Flights also available from other UK airports – Belfast, Birmingham, Bristol, Liverpool, London Gatwick, London Luton & Manchester – click here for more information on available dates and prices. Fly to Isle of Man airport where our coach will transfer you to your hotel in Douglas. Depending on your arrival time, you may have some free time to discover the town. Take the horse-drawn tram along the seafront (operating seasonally), stop for a drink and a bite to eat in one of the cafes and relaxed restaurants around North Quay, or uncover the island’s history at the Manx Museum. 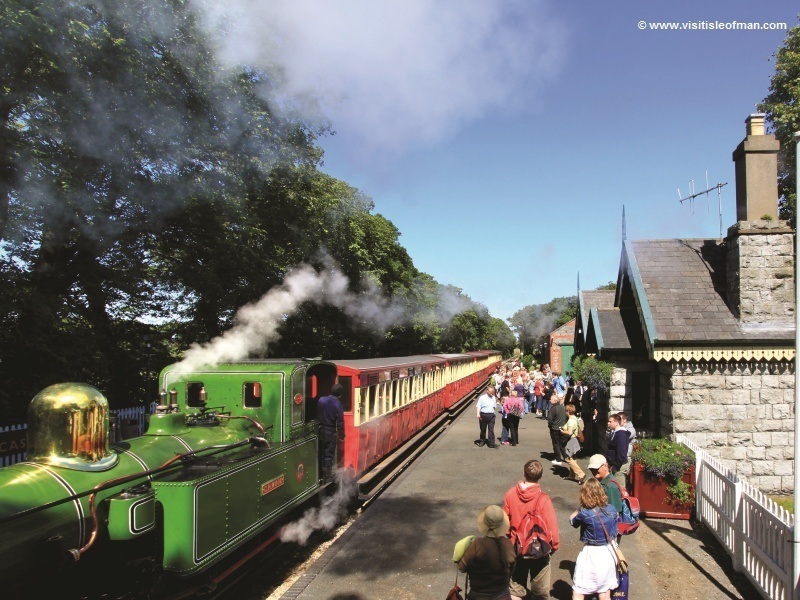 Once a complex network that served most of the island, the Isle of Man Steam Railway is now a single 15.5-mile route through woods, request stops, tiny stations and sea views to Castletown. Here you’ll have time to walk the battlements of Castle Rushen and see the debating chamber of the island’s 19th-century parliament building, before returning to the train to continue your journey to Port Erin. Once in Port Erin you’re free to explore – the beaches and views are glorious, and the Railway Museum is well worth a visit – then return to Douglas by train. Today we’ll head to Derby Castle station to board the lovingly maintained Victorian and Edwardian trains of the Manx Electric Railway (MER) for the scenic 17-mile journey to Ramsey. We’ll then board a bus and continue to Peel on the western side of the island. See the ruins of Peel Castle on its little peninsula on the tip of the marina, or visit the town’s Celtic heritage and transport museums before we wind our way back through the Manx countryside to Douglas. Our second journey on the MER takes us to Laxey, site of the world’s largest working waterwheel. Here we’ll change lines and ride the Snaefell Mountain Railway through the spectacular scenery to the summit of Snaefell 2000 feet above. Returning to Douglas you’ll have the rest of the day free before your final dinner at the hotel.